Checklist, Security, Scanner, Bigda.., oh sorry mistyping... The words are very familiar and popular. Let’s find out what they do mean. Is there a way to do mobile app security checking automatically? Fully? Partly? What can be automatized? HackApp Security Scanner performs static checks. And we are working to automate as much checks as possible. Let’s review a checklist which should be passed to reveal a level of app potential danger for end users and vendors. OWASP published a Mobile Apps Checklist (the complete checklist can be found at OWASP website) which contains 87 checks for Android and 74 checks for iOS. All the checks can be divided to those which are performed on the server side and those which are done on the client side (an app). Existing methods of checking app are static and dynamic. Statistic checks can be automatized pretty easily. We can code as well some of dynamic checks, for example: Proper SSL implementation, Account Lockout policy, different kinds of injections, etc. This is the good news. The bad news is that it is either difficult or very difficult to do the most of dynamic checks automatically, for example: Logic security (race condition and other), Input validation, Side channel data leaks, etc. ...you are welcome to check what we have new. 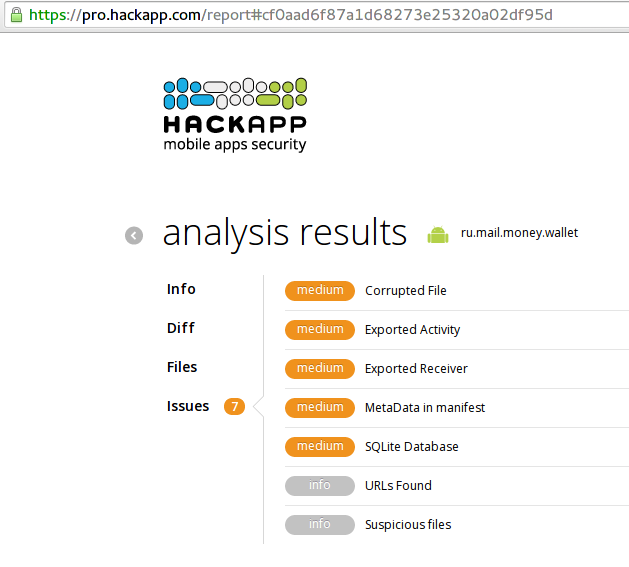 HackApp Scanner is an online tool. One of its purposes is to perform static checks without pain, desperation and time wasting. It’s always ready to use. An app can be analyzed just in a couple of clicks. So, there is a tool which does for us a part of our job. The tool is fast and always available. How does it work? You take an app and feed it to the scanner. The scanner produces a list of possible security issues in order of their severity: high security alerts, warnings, informative messages. Descriptions contain files/classes where issues were discovered and some other useful staff. Finally! We have the list. What should we do next? 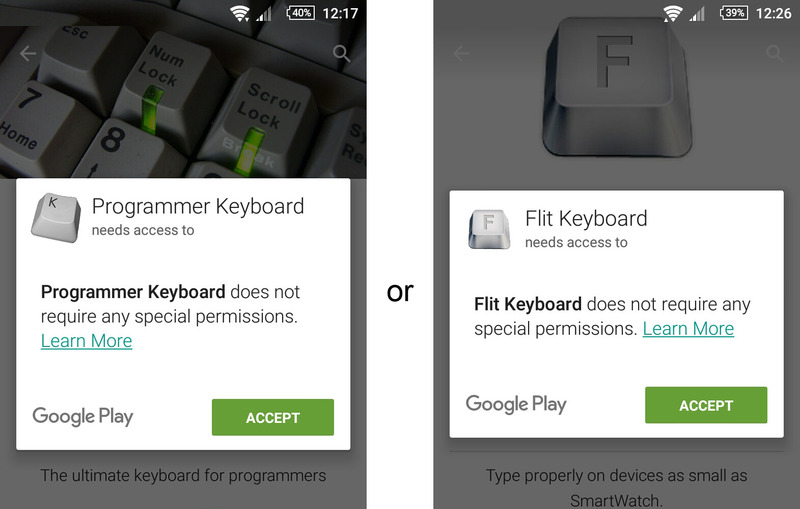 Quite often an app, especially a free one, requires an excessive access. If I can tolerate the absurdity of the access list I install the app if not… well, I just look for another app. Recently I came across a very greedy app. I could not pass by. 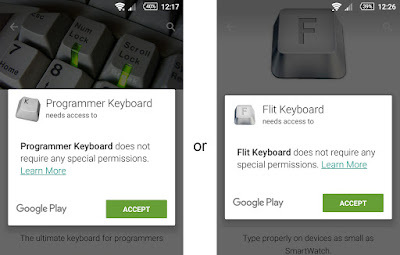 It could be that a keyboard cannot work without all this info and access or the app works only for good people… So it should learn first who I am and who my friends are.  What if I were a cloud? What if I were a cloud? I guess many security engeneers have been asking themselves this question in recent days. In this post I want to share my vision of the most critical steps in cloud storage for mobile devices. I do not claim an absolute correctness and there are no strict requirements, I wish this article could be a starting point for some technical discussions, while the topic is hot. Attacker has no inconspicuous physical access to victim's device. I know, that not all devices are equipped with a TPM chip (by the way, iPhone is equipped), but I heard, that SIM card can be used, as a TPM in some cases. If you know how it technically works, please let me know. A new device enrollment is a critical step because Cloud should be sure that this device is authenticated and not a source of malicious activity. 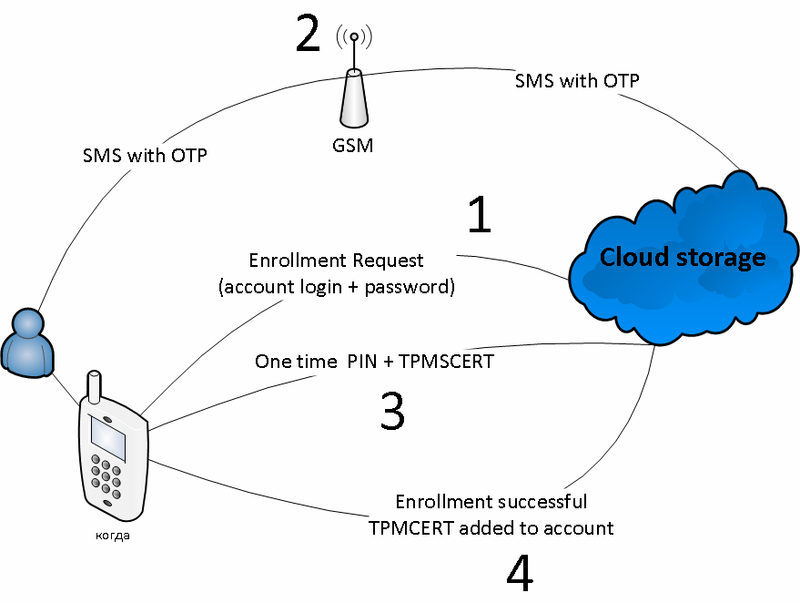 A device enrollment should be performed with two factor authentication. 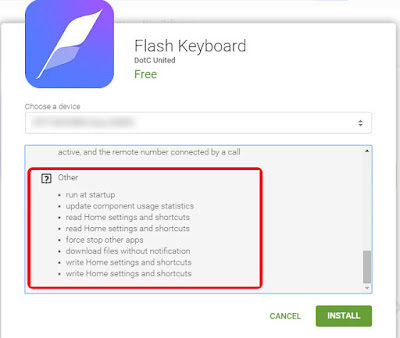 The second factor could be an OTP (one time password) sent as an SMS to the phone number associated with the account, or an OTP preset on any other device, which was already enrolled. For each new device the account owner should be notified by email. If OTPs from steps 2 and 4 are equal, the enrollment is successful. 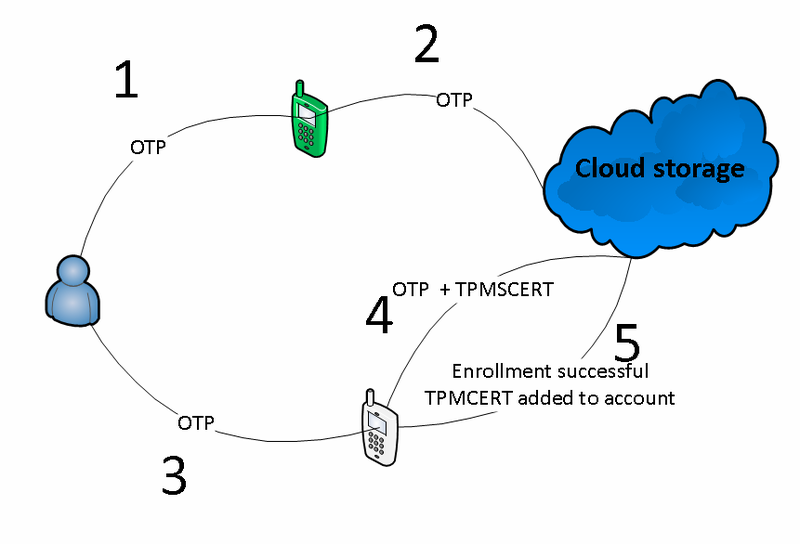 If OTPs from steps 2 and 3 are equal, the enrollment is successful. TPM signs Certificate request (TPMCRT), so we get an unique device certificate. If an attacker has an access to an enrolled device and can generate an OTP for a malicious device, the victim will get a notification. First of all - certificate pinning, it should protect us from SSL MiTM. This kind of attacks could be a result not just of compromised Certificate Authority, using MDM mechanism, corrupt system administrators could distribute malicious Certificate Authority to devices, and then perform SSL MiTM. Cloud decrypts it with the TPM public key, if it's ok, the authentication succeeded. TPM doesn't allow an attacker to gain access to Cloud, even if he or she was able to steal the private enrollment key (with a malware or forensic boot). We have the flexibility. For example, if we want to donate or sell the device, we can simply remove the enrollment key by device factory reset, or via Cloud web interface, if the device was stolen. If you notice any mistakes or if you whould like to add anything, I will be happy to find your comment in Hackapp Facebook group or in any other place (plese leave link in comments). I'm really sorry that talk given by @hackappcom and @abelenko on local @DefconRussia a group meeting (@chaos_construct event) few days ago have had such nasty consequences. And blackhat community performed such weak, cheap and ungrateful feedback. In justification I can only mention, that we only described the way HOW to hack AppleID. Stealing private "hot" data is outside of our scope of interests. We discuss such methods of hacks in our's narrow range, just to identify all the ways how privacy can by abused. For everyone, who was involved in this incident, I want to remind, that today we are living in a Brave New Global World, when privacy protection wasn't ever so weak, and you have to consider, that all you data from "smart" devices could be accessable from Internet, the Place of Anarchy, and, as a result, could be a source of undesirable and unfriendly activity. So, a weak "dictonary" passowrd (like P@$$w0rd) is not the best way to protect yourself in the modern world. But it's not your fault. It's a common problem of modern-being, that people use a technology without understanding all risks and consequences. Not all users are nerds (look - Jim Parsons account was not hacked!). and if you want to go deeper, you better join local Defcone group. API for your SDLC. Сheck your Apps before release! Now we have API, and there are a few words about why to use it and how. It's not a surprise that cost of fix depends on development stage, and patches for a released software are used to be the most expensive. And HackApp has not been able to help with it. Today we are happy to present API, which can be scripted into your SDLC. %secret_key% - your API authentication key, how to get it you can read futher. %app_id% - name of your app. %app_hackapp_id% - app id in HackApp, you will need it, to check status, or get report. "result": "success" - your app is analysed and you can get report. API is available in PRO version. To enjoy a free trial, please contact info@hackapp.com. Hi, I like SQLite database. Here is good example: Mail.RU wallet application. Extract pice of deleted data (if vacuum operation has not been performed). Aha! Test account and two active corporate accounts! You could try to find a password here, but this leak has been reported and already patched. This SQLite checker is only implemented in HackappPro engine, to get a free trial contact me at info@hackapp.com.